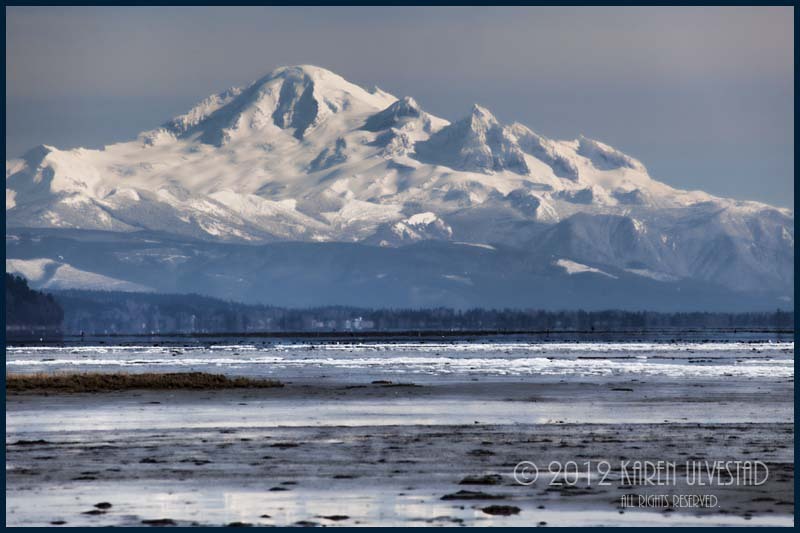 Landscape or cityscape photography depends on a sense of depth in the photograph. The idea is to show the details in the landscape, while telling a story about the place. Composition goes “hand-in-hand” with exposure of wild places, or structured cityscapes. This type of photography usually has a fore-ground, mid-ground and background, which leads the viewer through the image. In this first photograph, the fore-ground is the water. The mid-ground is the small spit of land on the left and what looks like ice on the water. The background is the mountain covered in snow. With the Aperture set at F11, the Depth of Field (DOF) starts in the mid-ground, and continues through the background. The inclusion of the fore-ground and mid-ground gives the viewer information about the location of the photograph. It contributes to the “story” of the place. Exposure for this photograph is 100 ISO, 1/100 sec at F11. It was shot with my 100-400mm lens at 400mm. 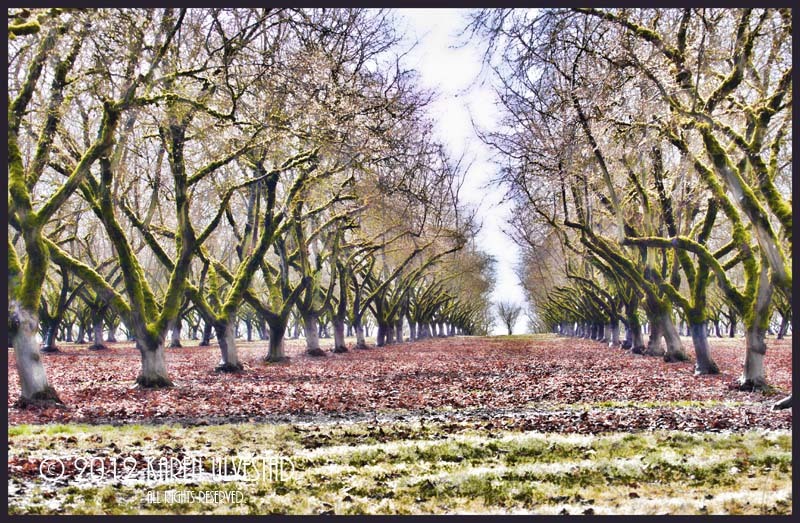 This second photograph was taken in a Filbert orchard in Oregon. I used the lines of the trees to create the feeling of depth. Using natural or man-made lines adds to the DOF in the image. The aperture for this photograph is F10, and the tree at the end of the row gives a sense of distance. In this one, I used complimentary colors (red and green) to add to the composition. This was taken in the early spring, before the leaves had come out on the trees. The exposure for this photograph is 100 ISO, 1/40 sec and F10. It was shot with my 100-400mm lens at 100mm. This last photograph is taken with a wide-angle lens. I shoot with a full-frame sensor camera, which makes 17mm a wide-angle lens. For those shooting with a cropped sensor in their cameras, wide-angle lens size starts at 14mm. 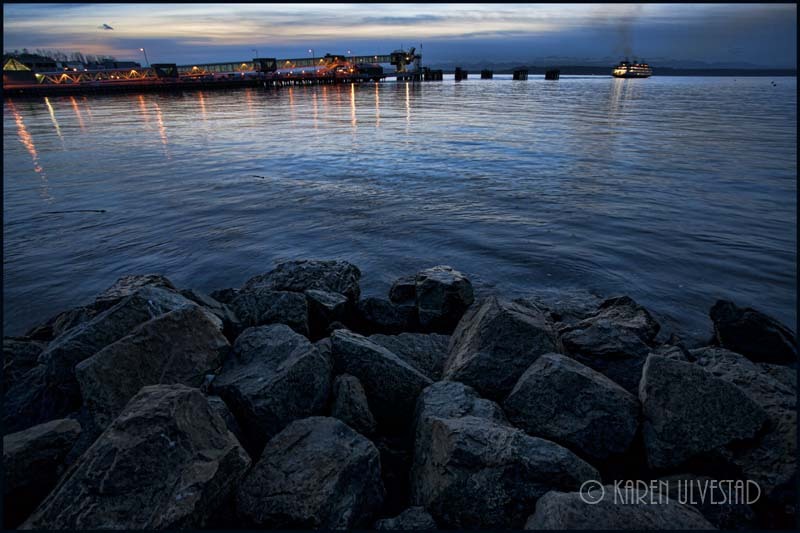 I used the fore-ground (rocks) to five a focus point for the photograph, and the ferry docks add a nice line. The lights from the dock spill out across the water, and create nice lines to counter the horizon line. In addition, I shot this one with the lit ferry boat coming into the docks. This was taken about 20 minutes after sunset. Admirable techniques for enhancing depth of the image, patterns like curves , horizontal lines also help in showing depths. You can see these effects easily while capturing pics in desserts or bridges. Thank you. . .the elements of composition can play a strong role in creating a sense of depth in a photograph. . .